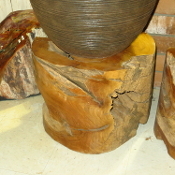 This wood base stands 20 inches tall. It measures 11 1/2 x 11 1/2 inches across. Please email for shipping charges. BASES ARE ONLY SOLD WITH PURCHASE OF A TABLE TOP. 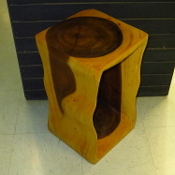 This wood base stands 23 inches tall. It measures 11 1/2 x 11 1/2 inches across. Please email for shipping charges. BASES ARE ONLY SOLD WITH PURCHASE OF A TABLE TOP. This wood base stands 23 1/2 inches tall. It measures 11 1/2 x 11 1/2 inches across. Please email for shipping charges. BASES ARE ONLY SOLD WITH PURCHASE OF A TABLE TOP. This wood base stands 15 inches tall. It measures 18 x 18 inches across. Please email for shipping charges. BASES ARE ONLY SOLD WITH PURCHASE OF A TABLE TOP.